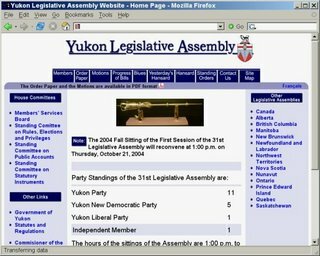 The Yukon Legislative Assembly has its Hansard online back to November 1987. Unfortunately, I am unable to find a way to view the Hansard record for any particular day. This webpage is a search engine that requires you to do a search on a keyword, before it will show you any Hansard record. I did a search on electric for "26 Legislature" and got eleven hits. Each hit then gave me access to the Hansard record for one day. For example, one of these hits pointed to the Hansard for November 10, 1987. This works okay, bringing up the Hansard for that one day. However, this is an "orphan" webpage — it does not have any navigation links to take me to any other webpage in this site. One of the basic rules of website design is that each and every webpage should have navigation links that enable the viewer to find his/her way to the other pages in that site. A search of the Yukon Hansard for the earliest mention of "information highway" turned up one on May 10, 1994. The earliest mention of "internet" is on December 1, 1994. 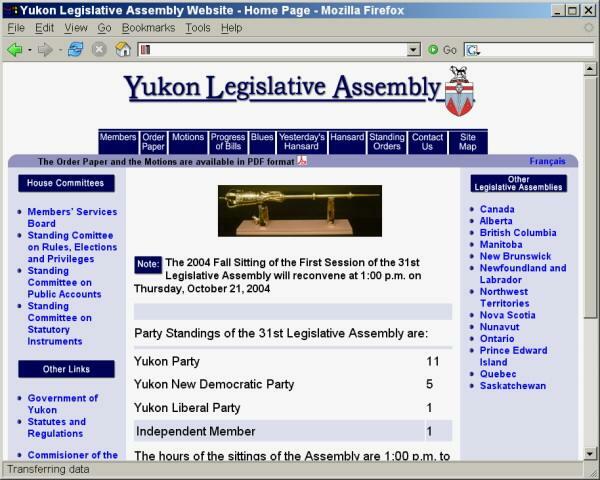 The Yukon Legislature website as it appeared on October 11, 2004. Screenshot date: March 25, 2006. For larger view, click on the image.